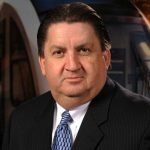 The podcast that Tom Lambert, President & CEO of the Metropolitan Transit Authority of Harris County, recorded for this blog describes METRO’s new Office of Innovation, which has proved to be a very effective generator of “out of the box” change initiatives. Reporting directly to Tom, the Office isn’t a traditional planning organization. Rather, it fosters, nurtures and pilot tests practical innovation projects in partnership with internal operational units and with external stakeholder organizations. As Tom points out, the success of the office owes much to a highly supportive METRO Board of Directors that accepts that while most initiatives will be mainstreamed, some will not make the cut so will not be continued. METRO’s Office of Innovation is an excellent example of applying a powerful new tool that Dave Stackrow and I call the “Change Investment Portfolio” process in our forthcoming book, tentatively titled Building a Solid Board-CEO Partnership: a Practical Guidebook for Transit Board Members, CEOs and CEO-Aspirants. 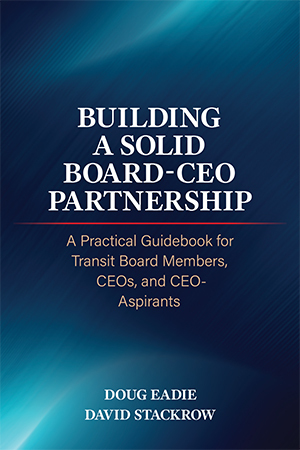 The following excerpt from Chapter Six of our book introduces the Change Investment Portfolio process, which we consider the “gold standard” for transit board governing engagement. There’s good news on the planning front. In recent years a very powerful change-focused planning logic and methodology have been developed and successfully tested in all sectors – for-profit, public and nonprofit. It is popularly called the “Change Investment Portfolio Process” (from this point on, “Portfolio Process”) but you can call it whatever you want; semantics aren’t a passion of ours. In a nutshell, the Portfolio Process, which is run parallel to, and separate from, your authority’s business-as-usual operational planning/budget development process, produces out-of-the-box change in the form of concrete projects that we can call “change initiatives.” These change initiatives are housed in what you might call your authority’s “Change Investment Portfolio,” where they are pilot-tested and eventually mainstreamed into the annual budget and ongoing operations – or occasionally abandoned if they’ve proved unworkable. Experience has taught us that there are three compelling reasons to make sure your board is intensively engaged early in the Portfolio Process. First, your board members are uniquely qualified to provide critical substantive input early in the change planning process, when your authority is focusing on the big picture (e.g., vision, values, strategic issues). It’s easy to take for granted – and if you’re not careful, fail to fully capitalize on – the tremendous resources board members bring to the change game, such as diverse, in-depth leadership and executive experience, knowledge and expertise in all kinds of fields such as finance and law, status and credibility in the wider world, and connections with key stakeholders, including potential joint-venture partners. Second, formal board review and approval confers indispensable legitimacy to such critical planning outcomes as updated values and vision statements, the issues to be added to the Change Portfolio, and the change initiatives that have been fashioned to address the issues, laying a stronger foundation for accomplishing out-of-the-box change. And virtually 100 percent of boards possess the power of the purse, which means they must formally allocate the dollars required to carry out change initiatives. And finally, it’s a rare Innovator-in-Chief who doesn’t at one time or another in the process need board backing in dealing with staff resistance to change. It’s important to keep in mind that commitment depends more on feelings of ownership than any other factor, and that the single best way to turn a key stakeholder such as your board into an owner is early involvement in shaping whatever it is you want owned. If your organization gets the board involved late in the Portfolio Process, when hands-on input isn’t feasible, then you can’t reasonably expect the board to feel firmly committed to the change initiatives in your authority’s Portfolio. Third, the Portfolio Process is so high-stakes in the context of our rapidly changing world – indeed, the preeminent key to your authority’s long-term stability and growth – and the work involved in updating your authority’s Portfolio is so complex and challenging, that we think of the Portfolio Process as the “gold standard” for board engagement, as we observed earlier. We’ve found over the years that board members inevitably find dealing with such heady matters as updating values and vision and identifying issues fascinating, energizing, and tremendously satisfying. One of the important outcomes of such involvement at the open end of the “change funnel” is, therefore, a more solid board-CEO working relationship, since productively engaged, satisfied board members inevitably make for better partners. Also keep in mind that the absence of early, meaningful board involvement in the Portfolio Process is a recipe for resentment and even alienation of board members, who cannot help but notice that they’re being consigned to the periphery of an exciting, highly important planning initiative.